The more casual observer might think a Pi Gamma Mu chapter lasts forever. After all, establishing a chapter requires great effort. Potential sponsors submit an application and the Board of Trustees begin the elaborate process of evaluating and, if appropriate, approving the new chapter. With all that complete, the sponsor can organize and begin the process of initiating members and coordinating activities. With the new chapter, everyone--Trustees, headquarters staff, sponsors, and students--enjoy the accomplishment. So, is the chapter set forever? Effective September 2015, the Pi Gamma Mu lifetime membership fee will increase to $50. This increase represents a difficult but necessary decision made by the Board of Trustees at the 2014 triennial international convention. It is the first increase since 2005 and will permit the society to keep pace with inflation and increasing costs while continuing to provide a considerable value for members. The lifetime membership fee remains at the $40 rate through August 31, 2015. We encourage chapter sponsors to invite as many students as are eligible at their schools prior to September in order to take advantage of the current $40 rate and to continue to invite all eligible students during annual or biannual membership drives in the future. Pi Gamma Mu is now registered with Smile.Amazon.com and GoodSearch.com. Both sites donate funds to non-profit organizations of your choice, such as Pi Gamma Mu, every time you use them - at no cost to you. With commencement ceremonies on the horizon, don't forget to order your Pi Gamma Mu honor cords. Display your accomplishments by wearing our royal blue and white twisted nylon cords with four royal blue tassels. Honor cords are $17 each (or $15 each for orders of 10 or more). To order Pi Gamma Mu honor cords go to our merchandise webpage and place your order using a credit card or PayPal account. Other official Pi Gamma Mu merchandise available includes men and women's t-shirts, polo shirts, sweatshirts, lanyards, replacement certificates, keypins, and more. 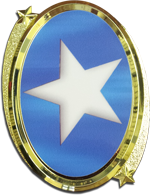 Our exclusive merchandise not only gives you the opportunity to proudly display your achievement and affiliation with the society, but merchandise purchases also support the activities of Pi Gamma Mu and help us finance our programs and awards. Thank you for your continued support of Pi Gamma Mu! 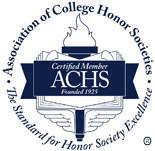 Suzanne Rupp, executive director of Pi Gamma Mu, attended the Association of College Honor Societies Annual Council Meeting in Reno, NV last month. The theme of this year's meeting was, "Knowing and Promoting the Value of College Honor Societies – Celebrating 90 Years of Aiming High". In 2012, the ACHS meeting focused on strategic planning which resulted in initiatives to be developed in 2012-2015. ACHS Board President and Psi Chi Executive Director, Martha Zlokovich, reported that those initiatives have been accomplished or are in progress as planned. Chapter news in this issue comes from the New York Tau chapter at Pace University, the Pennsylvania Kappa chapter at Mansfield University, the Delaware Beta chapter at Wilmington University, and the Pennsylvania Alpha Omicron chapter at Washington and Jefferson College. 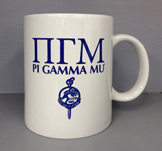 We are excited to announce that we are now offering Pi Gamma Mu coffee mugs for purchase via our merchandise webpage. Our exclusive merchandise not only gives you the opportunity to proudly display your achievement and affiliation with the society, but merchandise purchases also support the activities of Pi Gamma Mu and help us finance our programs and awards. Mugs are $7 each. National Wreaths Across America remembrance ceremonies were held on December 13th, 2014; 12 Noon EST. The Wreaths Across America mission, Remember, Honor, Teach, was carried out by thousands across the nation -- especially by the members of the West Virginia Iota Chapter of Pi Gamma Mu who were in attendance on this solemn occasion. Dr. Clara Small, Second Vice President of the Pi Gamma Mu Board of Trustees and Salisbury University Professor (Ret. ), profiles 56 notable African Americans in her new book Compass Points: Profiles and Biographies of African Americans From the Delmarva Peninsula. The 317 page book got its start back in 1998 when one of Dr. Small's students made the comment, "Blacks have never done anything in this country, nor on the Eastern Shore." That night, Small stayed up all night and wrote a 32 page manuscript. Over the next 15 years, Small continued to work on her labor of love. Pi Gamma Mu is a 501(c) (3) nonprofit corporation and is able to accept tax-deductible donations. If you would like to make a donation to our organization in honor / memory of a professor, sponsor, loved one or friend, or to support our scholarship program, you are encouraged to do so. Pi Gamma Mu gives 11 scholarships to students going into a graduate program in social science each year. Increase your chapter's number of new initiates by 20% or more as compared to the previous academic year. Add a link to the Pi Gamma Mu "Start a Chapter" webpage to your chapter's website. Increasing your chapter's membership helps Pi Gamma Mu accomplish its mission to encourage and recognize superior scholarship by extending the benefits of membership to more students. Increasing membership will also benefit more of the high performing students at your school with opportunities for scholarships, publications, networking, and more. Here at Pi Gamma Mu, we see social media as another way for us to carry out our mission to encourage scholarship and to foster cooperation and service among our members. Now you can connect with us and other members and supporters of Pi Gamma Mu on the social networking sites you like to use. 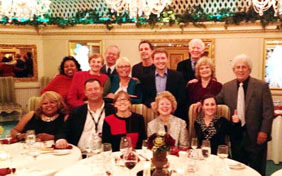 We welcome your comments, posts, and photos of chapter activities. Be sure to like us on Facebook, follow us on Twitter, and connect with us on LinkedIn to see announcements, opportunities, and deadlines (such as the scholarship application deadline). LIVE. LEARN. INTERN. in WASHINGTON D.C.
Are you still deciding what to do this summer? It's not too late to spend 8 weeks in Washington, D.C., completing an internship, earning credit, and expanding your professional network. Unlike many other Washington, D.C., internship programs, DCinternships.org guarantees you an internship placement with a federal agency, embassy, government affairs office, media outlet, policy group, or nonprofit organization. Their staff works to place you with an organization that fits your skills and career goals. You'll gain real-world experience that will set you apart when it's time to find your first job after graduation. When you graduate, please send us your new email address if you have been using your college address to receive the Pi Gamma Mu Newsletter. At some point (each college is different), your college email address will be eliminated and you will no longer receive the newsletter or other information from Pi Gamma Mu.